Christmas is awesome! You get presents, eat tons of food and are obliged to endure Aunt Margaret’s sloppy, lipstick-plastered cheek kisses. A lot of kids will even tout Christmas as their “most favoritest” holiday of the year. Presents are great and all, but as far as sheer fun factor Halloween takes the cake! What other day each year encourages us, adults and kids alike, to dress up as someone else—to costume ourselves as a zany character, hilarious parody or spectacular hero? Yeah, Halloween is the best. Plus there’s candy, loads and loads of candy! We haven’t forgotten about the time you didn’t plan ahead and had to come up with a last minute costume for your little bumblebee, slinky kitty cat or roaring lion. We get it, you’re busy! This year, make sure your tyke is dressed to the nines in all their nerdy glory. And for those DIY-ers at heart, scope the easy how-to ideas for making your own version of each costume below. The Angry Birds mobile app has swept the nation! Adults and kids alike clamber to level up on this infectious game in which almost wingless birds are flung via a slingshot into a structure to hit their pig enemies. Don’t worry—there’s no gore involved in this battle. What better way to sport your nerd pride than dressing up your wee one in this fun costume? You can even follow along and recreate this costume with a handy Instructables DIY. A homemade Doctor Who costume will most certainly position your young’un as the nerdiest kid on the block. This cult TV phenomenon about a humanoid alien who travels through time and space in his TARDIS (space ship) has inspired many works of art, crafts, and other geekery. The Doctor fights evil far and near with the help of his companions. This snazzy costume idea is a winner all around! Creative? Check. Cute as all get out? Check. Nerdy to the extreme? Double check. Katamari Damacy, a third-person puzzle-action video game, has enjoyed moderate success in Japan and South Korea and has swept the nation here in the US, enticing all manner of geek and enthusiastic game player to join in the craze. A katamari is a ball controlled by the Prince of All Cosmos that collects items as it rolls over them in the different levels of the game. The items start out small, and as the ball gets bigger so do the items its capable of picking up. Once the ball is as big as it can get it in the time allotted, it’s thrown into the sky to become a star. 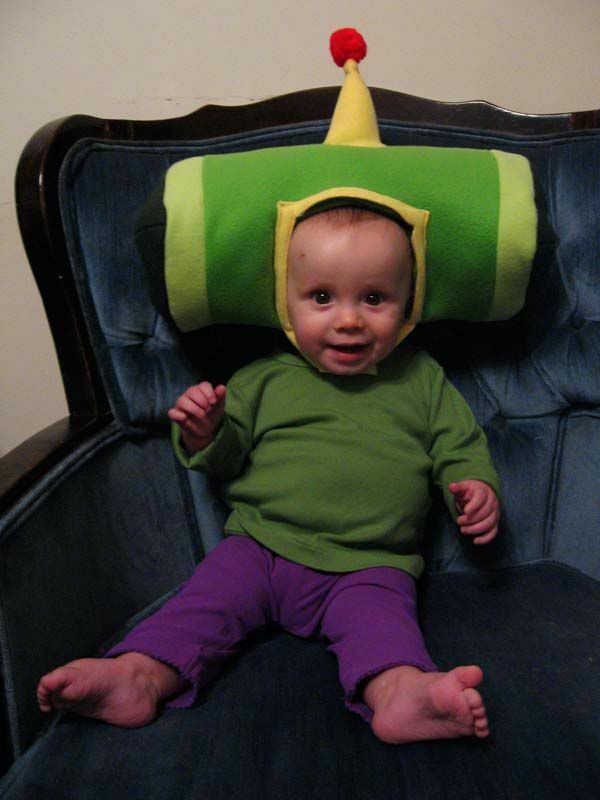 This Prince of All Cosmos costume is dandy and totally easy to whip up! This costume is so magnificent it appears to have been put together by Hollywood professionals. Nope, it’s a complete DIY project. Edward Scissorhands comes from the mind of Tim Burton, who gave us Beetlejuice and The Nightmare Before Christmas. If you haven’t seen the movie, it’s about a man created with scissors for hands who falls in love with his adoptive family’s teenage daughter. This costume shows an impeccable likeness to the protagonist himself. Don’t sweat the scissors on the fingertips, they’re just plastic. Other rad costumes include a homemade Lego man, a comfy Dobby the House Elf or even a Rubix cube (surprisingly easy to DIY)! Nerd-tastic kids’ costumes don’t have to be a pain in your wallet or in your bum! Get creative, use what you already have laying around the house and have fun with it. Your kid’s new Halloween costume will be the envy of all the candy-foraging ghosts and ghouls of the hood.